Ather Energy has commenced deliveries of its electric scooters in Bangalore. Select customers were invited to the company's assembly unit to collect their Ather 450 e-scooter. Private charging stations have also been installed at their residences. 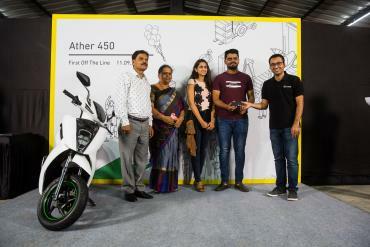 The Ather 340 and Ather 450 were launched in June 2018. The two models are priced at Rs. 1.10 lakh and Rs. 1.25 lakh (on-road, Bangalore), respectively. The e-scooters come equipped with features like a 7.0-inch touchscreen instrument panel, LED lights and Parking Assist with a reverse mode. They are powered by a Brushless DC electric motor (BLDC). The Ather 340 has an output of 6 BHP and 20 Nm and comes with a 1.92 kWh lithium-ion battery, while the 450 variant makes 7.2 BHP and 20.5 Nm. It gets a 2.4 kWh lithium-ion battery. The claimed maximum range of the two scooters is 86 km and 107 km respectively. The e-scooters come equipped with a 200 mm disc brake at the front and a 190 mm disc brake at the rear. They get a combined braking system and regenerative braking. Currently, the Ather 340 and Ather 450 e-scooters are only available in Bangalore. The company has started working on setting up its public charging network called Ather Grid in Chennai, where its first dealership is expected to be opened in Q2 2019. The company plans to launch its products in other cities in a phased manner.